Travel Time Maps Composed by NOAA using Tsunami Travel Time Software. Reported tsunamis: The National Centers for Environmental Information has an online database of tsunami reports that can be accessed through an interactive map. The image above shows locations of reported tsunami observations along the eastern United States and through the Caribbean. If you visit their interactive map website you can query any point shown above for more information. NOAA image. 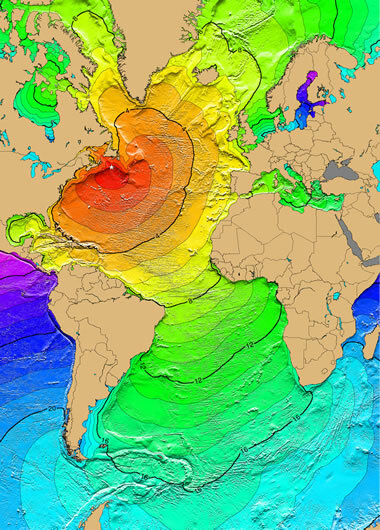 A tsunami in the Atlantic Ocean is a rare event. Part of the reason for this low incidence of tsunamis is the lack of subduction zones - the most common source of tsunami-causing earthquakes. Although the incidence of Atlantic tsunamis is low, the threat should be taken seriously because millions of people live in low-elevation locations around the rim of the Atlantic basin. The travel time maps below show that once a tsunami is generated, the response time for mass evacuation can be uncomfortably short. A magnitude 7.3 Mw earthquake on October 11, 1918, in the Mona Passage, west of Puerto Rico, was caused by displacement along four segments of a normal fault, oriented N-S in the Mona Canyon. The earthquake generated a tsunami with runup heights reaching 6 meters, causing extensive damage along the western and northern coasts of Puerto Rico. The earthquake and tsunami caused $29 million damage, 116 people were killed and 100 were reported missing. Map and caption by NOAA. Click for larger map. 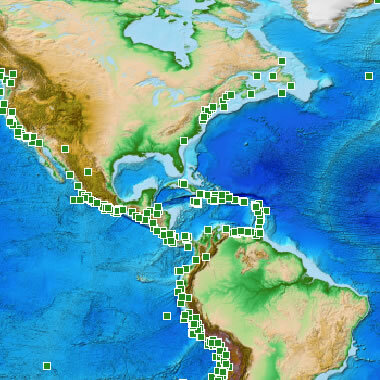 The only subduction zones in the Atlantic basin are along the eastern edge of the Caribbean Plate and the eastern edge of the Scotia Plate in the South Atlantic. These subduction zones are small, they are not exceptionally active, and that accounts for the low incidence of earthquake-generated tsunamis. The magnitude 7.3 earthquake that occurred off the northwest coast of Puerto Rico on October 11, 1918 was a subduction zone earthquake. It generated a tsunami with a run-up height of 6 meters that caused extensive damage and killed over 100 people. A travel time map for this tsunami is shown on this page. A large earthquake, Modified Mercalli Intensity XI, in Lisbon, Portgual, caused damage to north of Granada, Spain. The earthquake generated a tsunami that affected the coasts of Portugal, Spain, North Africa, and the Caribbean. The tsunami reached Lisbon about 20 minutes after the first destructive shock. It rose to about 6 meters at many points along the Portguese coast and reached 12 meters in some places. It also affected the coast of Morocco where the streets of Safi were flooded. The tsunami reached Antigua about 9.3 hours after the earthquake. Later waves, with estimated runup heights of 7 meters, were observed at Saba, Netherlands, Antilles. The earthquake and tsunami killed between 60,000 and 100,000 people. Map and caption by NOAA. Click for larger map. 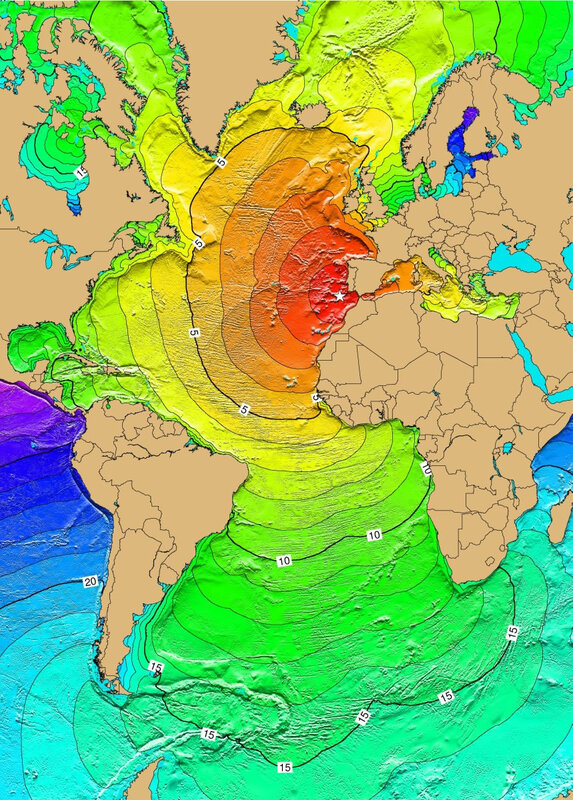 The most widely known Atlantic Ocean tsunami struck Lisbon, Portugal on November 1, 1755. It was caused by a magnitude 8.6 earthquake beneath the floor of the Atlantic about 100 miles offshore. This earthquake and associated tsunami destroyed most of the city of Lisbon. Waves up to 12 meters high hit the coastlines of Spain and Portugal just minutes after this earthquake. Over nine hours later, waves with seven-meter runup heights arrived in the Caribbean and caused significant damage. The earthquake and tsunami killed between 60,000 and 100,000 people. A travel time map for this tsunami is shown on this page. Submarine landslides have caused tsunamis in the Atlantic Ocean. On November 18, 1929, an earthquake on the southern edge of the Grand Banks, south of Newfoundland, triggered a large submarine landslide that generated a tsunami. That tsunami was recorded all along the eastern coast of the United States and in the Caribbean. At least 28 people were killed in Newfoundland. A travel time map for this tsunami is shown below. Some researchers believe that a large landslide in the Canary Islands could generate a tsunami with basin-wide impact. 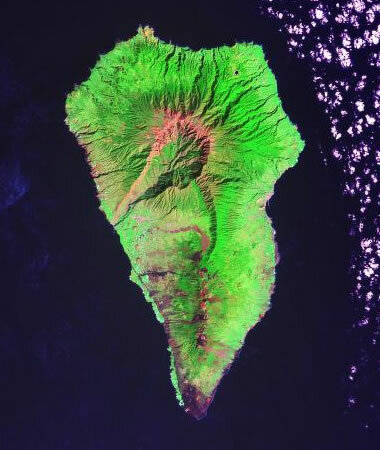 Faults on the southwest side of La Palma Island associated with Cumbre Vieja Volcano could be the detachment surface of a mega-landslide (see satellite image below) . The idea that this type of landslide in the Canary Islands could produce a large wave with local impact is not disputed. However, a much larger number of researchers believe that the basin-wide impact is an "extreme scenario based upon a highly unlikely combination of events that is without precedent" . Some researchers believe that a large landslide in the Canary Islands could generate a tsunami with basin-wide impact. Faults on the southwest side of La Palma Island associated with Cumbre Vieja Volcano could be the detachment surface of a mega-landslide (see image) . On November 18, 1929 a magnitude 7.4 Mw earthquake occurred 250 km south of Newfoundland along the southern edge of the Grand Banks, Canada. The earthquake was felt as far away as New York and Montreal. It triggered a large submarine slump which ruptured 12 transatlantic cables in multiple places and generated a tsunami. 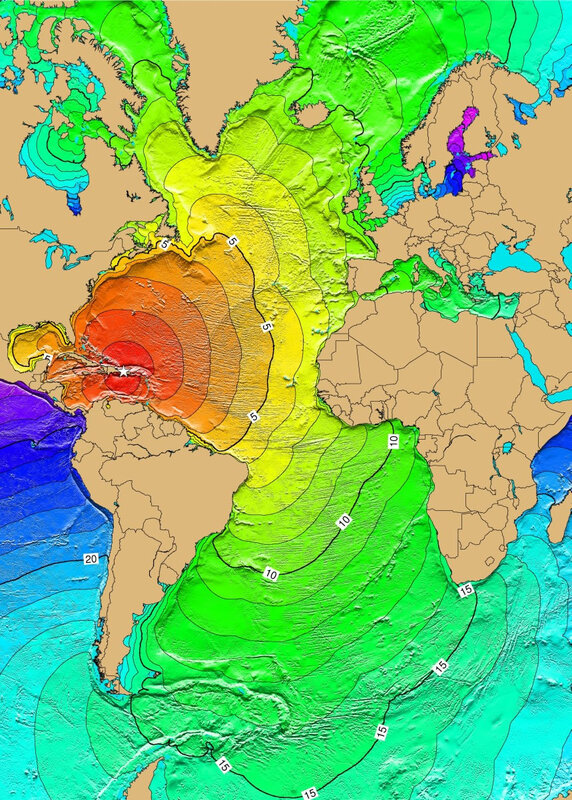 The tsunami was recorded along the east coast of Canada and the U.S., as far south as Martinique in the Caribbean, and across the Atlantic Ocean in Portugal. The tsunami caused an estimated $1 million damage and 28 deaths in Newfoundland, Canada. Map and caption by NOAA. Click for larger map.